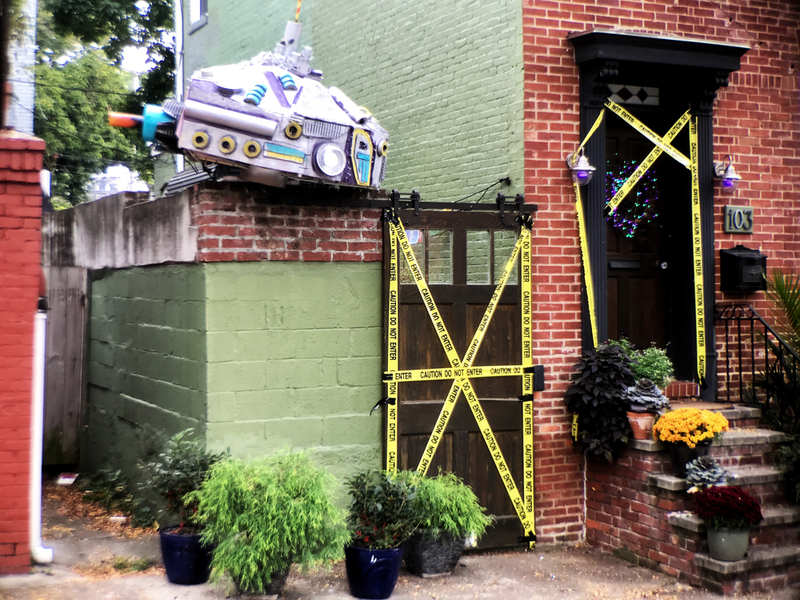 Five days before Halloween, a spaceship crashed into our house. Despite daily calls to 311 the city left it sitting there for over a week - glowing and leaking god-knows-what. When the multiverse hands you grolpchacks, you make gripplesturm. First up: build the structure. The ship was built from a bunch of home insulation material, PVC, cardboard, an old camping pad, and a foam pool noodle. I did the construction. The boy handled the details. Since the story was about a ship with a whole lot of miles on the odometer, the less we stressed about fine-tuning, the better off we we'd be. With the framework complete and the foundation of the body attached, it was time for the what the model-makers at ILM call greebles: the tiny little bits added to make something appear more, well, interesting. This task fell to the boy. Electrical work took place after bedtime. Feature effects came from an old set of Christmas lights and a handful of programmable light bulbs repurposed from upstairs. They made the engine glow and the tractor beam... tractor? Not pictured: The rear panel swung up for easy access to the guts. Looks a little like a flux capacitor, no? Beep-boop-beep. Check out that sweet engine glow. Sooooo... All the work I did to make sure the ship didn't fall onto the sidewalk? All it took was a storm and a bit of wind to undo it. Turns out I didn't account for the ship falling in the other direction. Luckily the patio lights served as a sort of safety net and caught it on the descent. No real damage done. One evening and a new mounting system later and we were back on top. Literally. Because audience participation is what Halloween's about. Audience participation and fog machines. Find some images of x-rays online, print them out on acetate, and presto: instant mystery!